When we left Vermont back in June of 2012 our first three stops were at New York state parks. At the time I remember them making a good impression — but then again we were so excited about our new lifestyle that anywhere would have seemed great. 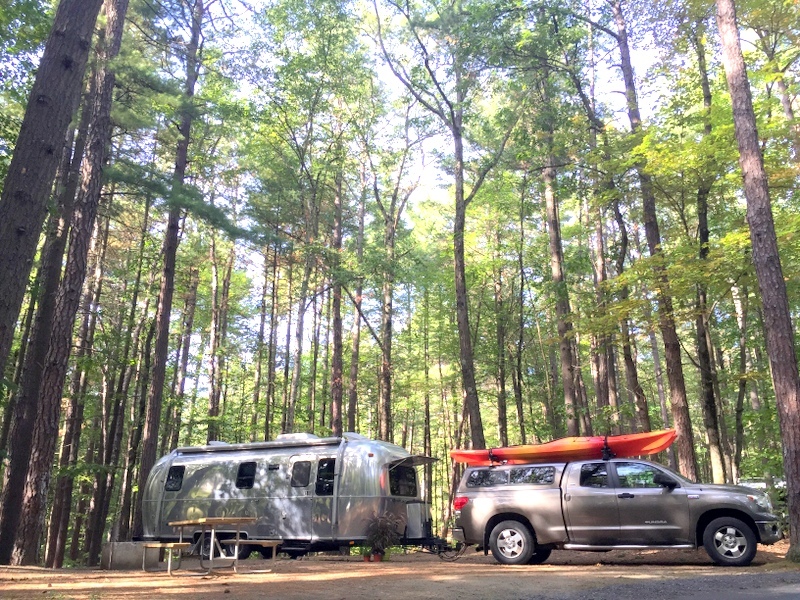 Well…I’m happy to report that three years and hundreds of campgrounds later our second experience with New York state parks was just as great. 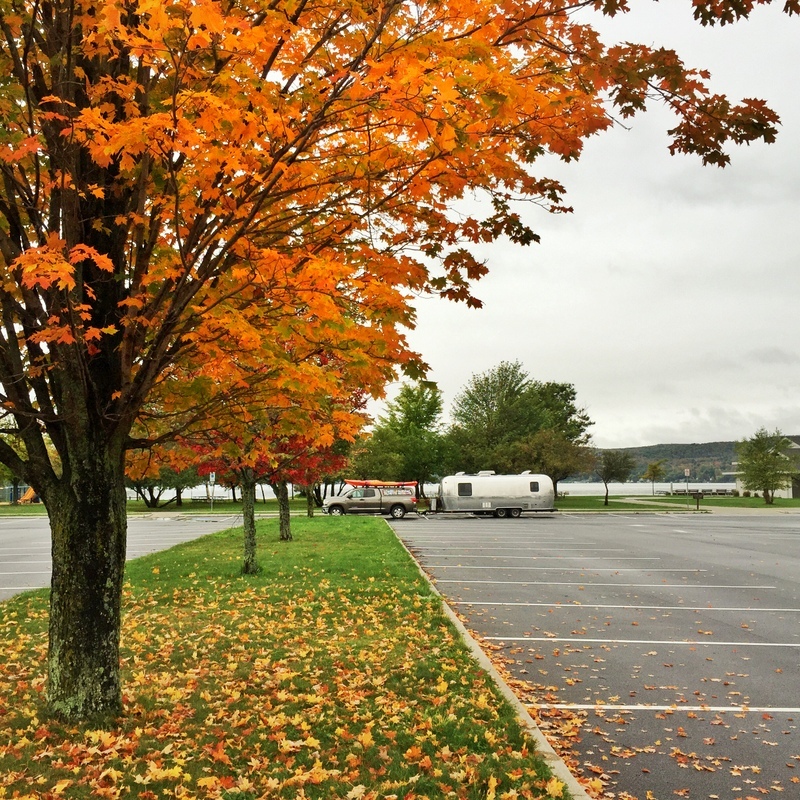 The unusually warm weather in Vermont must have caused us to forget what time of year it was because we were caught off guard by the amount of campgrounds that were already closed for the year. 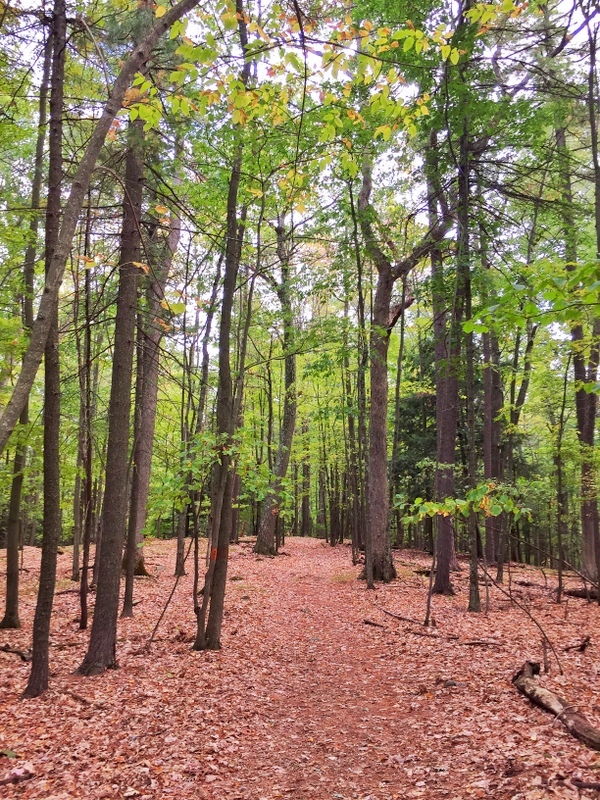 Luckily a few, like Moreau Lake State Park near Glens Falls, stay open into October. Apparently we’re not the only ones still wanting to enjoy a camping weekend because when we arrived on Saturday the place was hopping and there were only three available sites for our size. They were all nice, wooded sites, and we found one that was large enough for us to fit into without unhooking the truck (essential for a one night stay). 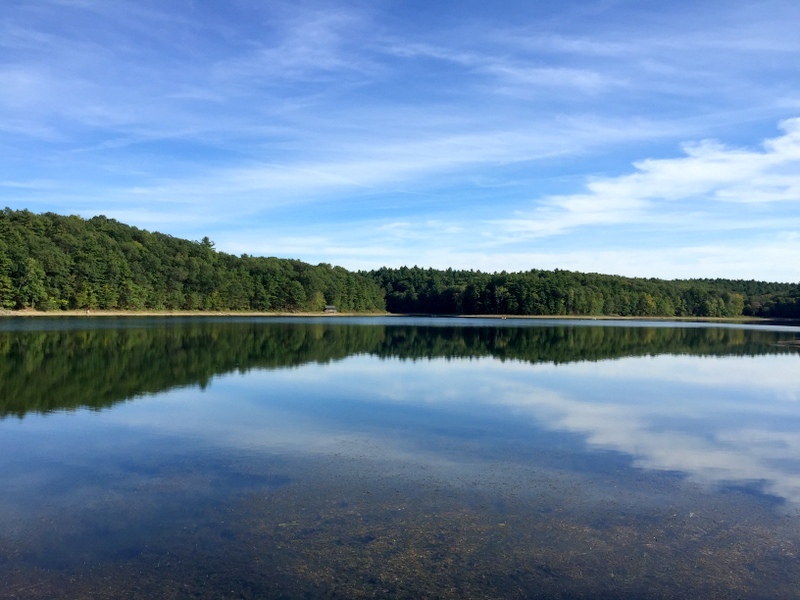 Moreau Lake is a fairly small body of water surrounded by low rolling hills. There’s a sandy beach (no swimming allowed after Labor Day) and a network of trails that wraps around the lake and travels up into the woods. We did the 3 mile loop around the lake which gave us both lake side and wooded views to enjoy. The next day we packed up and drove two hours south. Our normal schedule of driving 3-4 hours and staying for a week is getting pushed aside over the next few months. We basically have 12 weeks to drive nearly 3,000 miles to reach Tucson, AZ where we will be meeting Tim’s mom for Christmas. That might sound like a long time, but if you take into account that it took us six months to travel from the Florida Keys to Vermont at our normal rate, it becomes obvious that we need to step it up a bit if we’re going to make it on time. Which is fine with us. After a leisurely pace these last few months we’re ready for some traveling. But we still need to work during the week, so the plan is to drive mid-week after work, and then again on the weekends so we can make some miles. 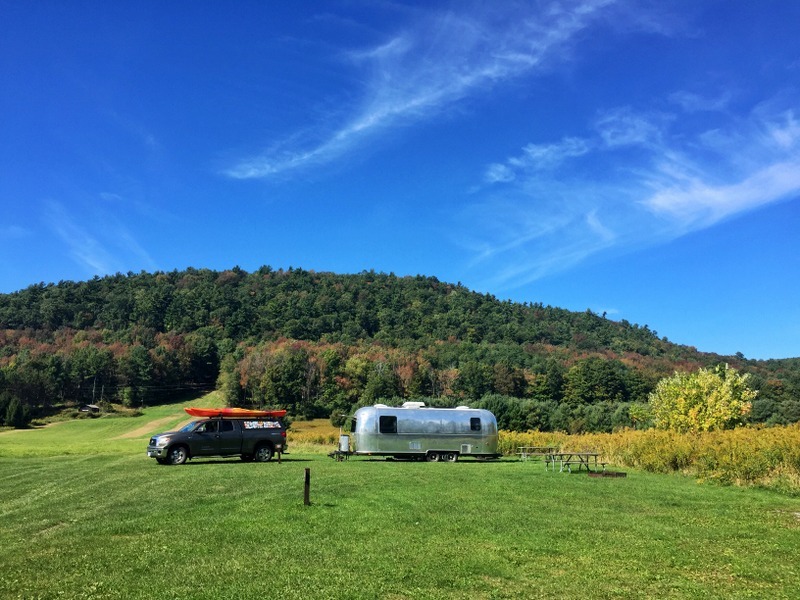 Our next stop was Glimmerglass State Park where we fully expected another wooded campsite, but when the attendant told us about the grassy overflow lot with no hook-ups for $9/night less, we didn’t hesitate to say yes. The best part? We were all alone! One of the things that attracted us to this park was the large lake, which until we arrived, I thought was called Glimmerglass. 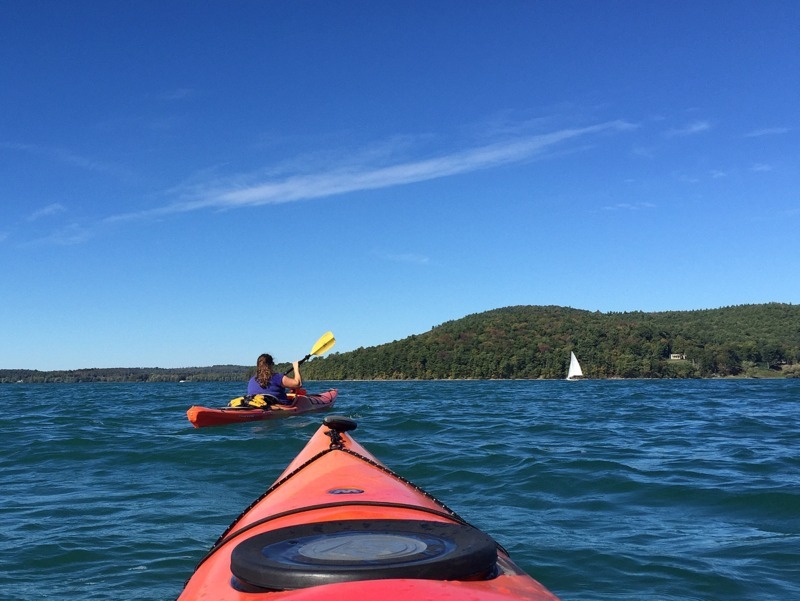 It’s actually Lake Ostego, but Glimmerglass is a much better name don’t you think? 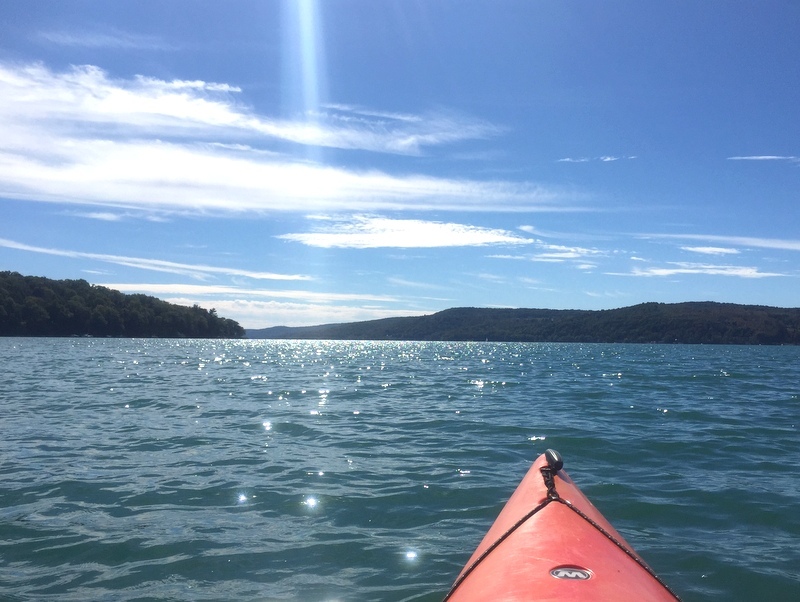 Funny story — “Glimmerglass” is the name that author James Fenimore Cooper gives the lake in his Leatherstocking Tales, a series of five books that includes the Last of the Mohicans (yes it was a book before it was a movie), and The Pioneers, a novel which made a lasting impression on me when I read it in college. I just love it when literature and real life intersect. The first order of business was to get out on the water. Tim had an ambitious plan to go all the way down the lake and find a place where we could dock the kayaks and then walk around Cooperstown (something about ice cream was mentioned), but that plan was quickly abandoned when we realized just how large the lake was. Instead we paddled around for a few hours enjoying a perfect early fall day. Aside from the lake, the campground also has miles of hiking trails. We tackled the Sleeping Giant trail that wound up and around a small mountain. It was a nice hike through the woods that would have been even better if it offered a view of the lake. At the end of the trail we discovered an an old mansion perched high on the hill overlooking the lake. 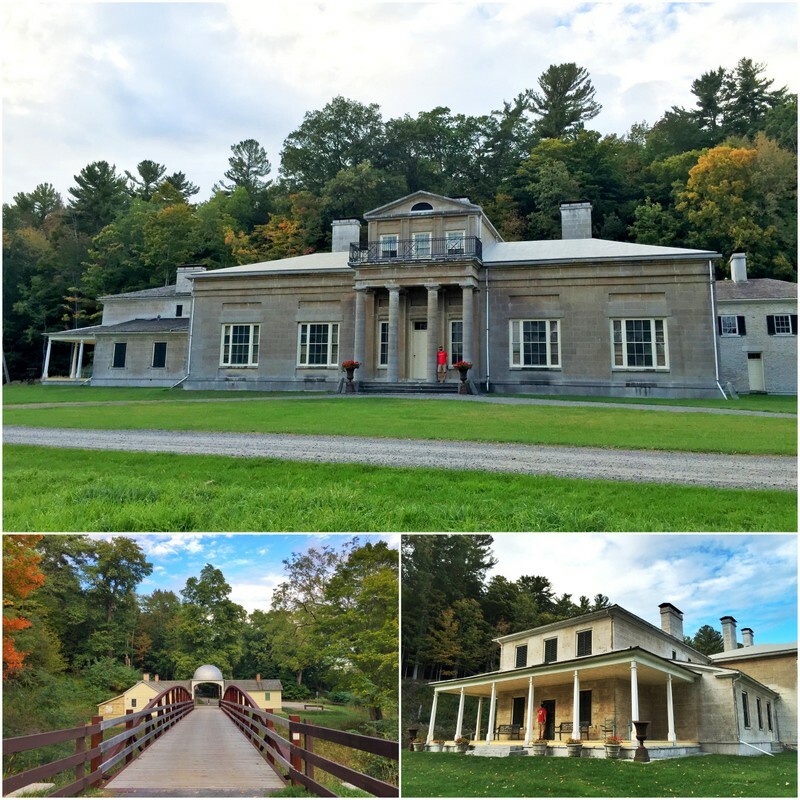 This is Hyde Hall, a 19th century estate that once belonged to Englishman George Clark. The great grandson of a George Clark I, who was a prominent member of the colonial government, the younger George inherited a vast amount of land from his namesake and had a grand house built on it that took 17 years to complete. The three section, 50 room house features impressive architectural details that show off a variety of styles popular at the time. Unfortunately, we didn’t get to see any of those details because while the house is open for tours from May through October, we missed the last one by about an hour and had to settle for peeking in the windows. On Tuesday the rain arrived and put a damper on any further outside exploration. So we went to a brewery instead — actually we went to two breweries. 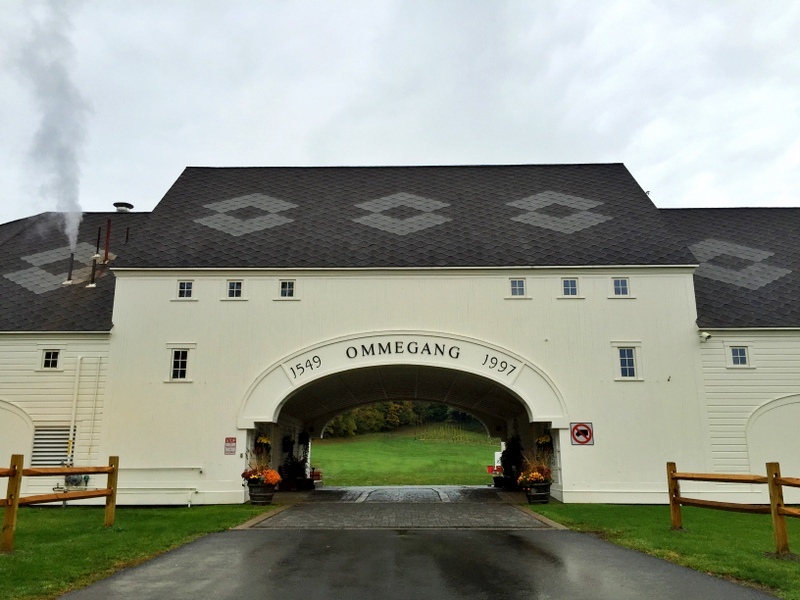 The first was a Belgian style brewery called Ommegang. This impressive looking brewery was built here in 1997 on land that was once a hop farm. These days there are no hops growing (aside from a small test plot), but there is a whole lot of beer being made. We arrived at Ommengang just in time to join the complimentary tour, followed by a $5 tasting. The tour was fairly dull (they usually are — I mean how exciting can a bunch of large holding tanks be? ), but the tasting was a hit. We both really like Belgian style beers and Ommegang does it right with lots of spice and hints of fruit in all their brews. 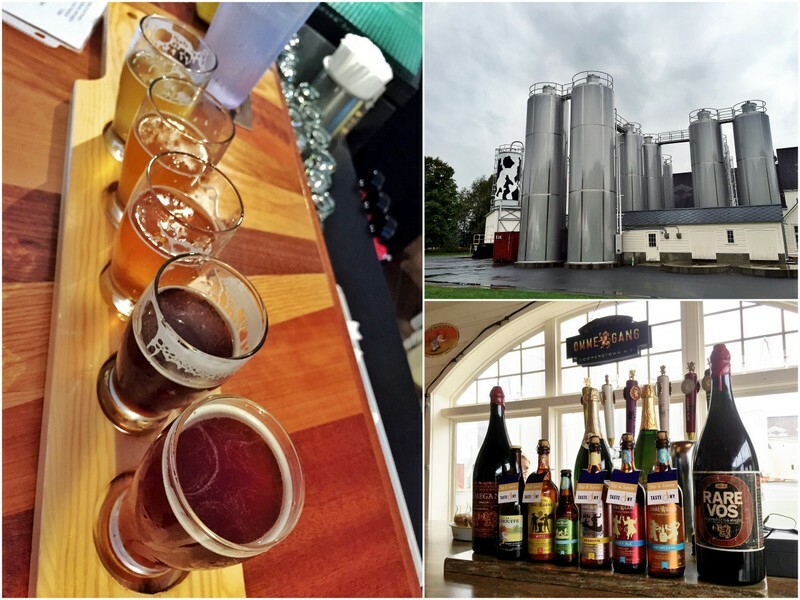 Since one beer tasting is never enough, we headed over to Council Rock Brewery for more beer and a bite to eat. This place could not have been more different than Ommegang. No giant tanks and impressive barn-like structure here. Instead we found a tiny nondescript building where they brew their beer in the back 100 gallons at a time. We orderd a tasting flight along with a tasty dinner. Overall, I would say that I liked the beer at Ommegang better, but my Taste of Tunisia Chicken Salad and Garlic-Pesto Fries (because…balance) was so good that I was able to overlook the only okay beer selection. The rain continued through the night and into Wednesday which confirmed our decision to head on down the road. Since we couldn’t leave until Tim was done work at 4 we moved over to the day use parking lot near the beach and worked for the afternoon before heading out. It’s always nice when campgrounds have RV friendly day use areas. Up next — Pennsylvania here we come! Starting to see some upcoming closing dates in parks here in the Sierras. Although we’re still in the 80’s. 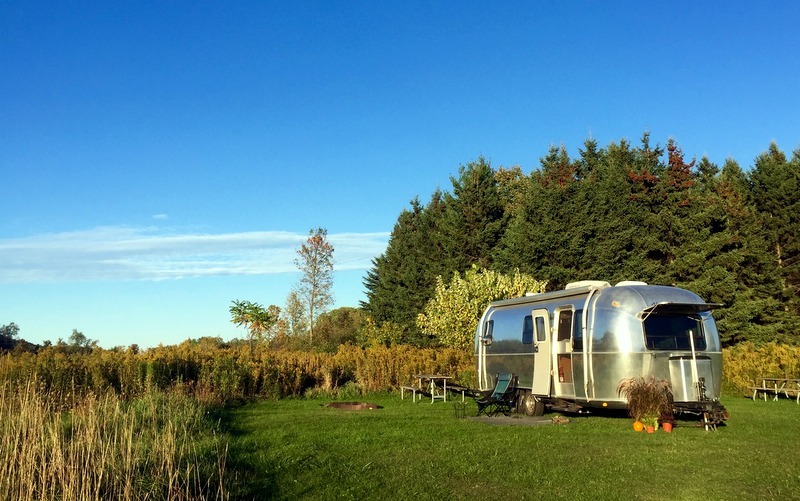 Those NY campgrounds are really beautiful – I always forget the state is more than just the city. Lovely shot on the trail with all the leaves on the ground! The old mansion and brewery are beautiful buildings. Safe travels – that is a lot of miles to cover!! It’s fun to be on the move! After not traveling far these last fews months it feels good to be putting those wheels to good use. Really beautiful parks. We’ve only stayed in one of NY’s parks on our way to somewhere else. Would they be affordable for 6 or 8 weeks in the late spring? Love that overflow lot. Your pace from FL to VT is my preferred pace too. I’ll be interested to watch your route between NY and AZ. It depends on your definition of affordable. They tend to be around $30/night (on par with most northeast SP). This was the first time we have come across one with a cheaper ($17/night) overflow option. I agree, the slower pace is more ideal because it gives us time to explore the surrounding area. Love Glimmerglass SP. try Sampson on Seneca Lake. Lots of good campgrounds in the Adirondacks . 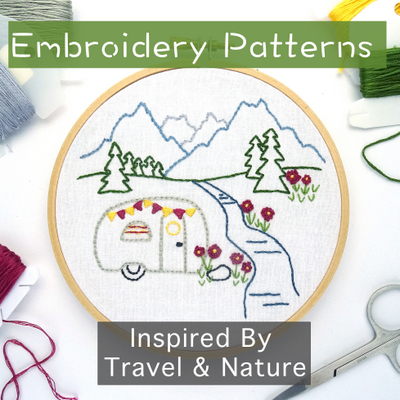 I hear the campgrounds in the Thousand island region are lovely too. We are currently at French Creek Sp about an hour outside of Philly, waiting to see what the hurricane will do. We need to be in Charlottesville area at the end of next week. This place is quiet and high and dry. Plenty to see within an hour of here. Good travels. We actually stayed at Sampson SP and a state park in the Thousand Island region back in 2012. Both were very nice, although Sampson might have been a bit large for our taste. Safe travels on your way to Charlottesville. Ha, we’re going to only have about six weeks to get to Florida from southern Oregon — way too fast for our preferred pace of travel, but essential since we have reservations the first two weeks of December in the Keys. And you know how difficult those reservations are to get! The New York state parks look beautiful — one of these days we’re going to get ourselves there. Oh wow! That is a fast pace. But you can’t waste those Keys reservations. Have fun! Ommegang looks amazing! For a fun brewery tour, try New Belgium if you are ever back in Fort COllins, CO. It’s so fun you have to reserve a spot on a tour days or weeks in advance! Yes, we like Colorado state parks as well. NY doesn’t have a day use fee, but they make up for it with a $5/day out of state fee (don’t you want me to visit your state?) I remember your post about New Belgium. It’s definitely on the list for next time we’re in CO! Great read. It brought back many memories. I grew up in Cooperstown and attended my 50 year high school reunion in September of 2014. I live in the Dallas area now. When I tell people I grew up in New York I always feel compelled to say “upstate”. Everyone associates New York with “The City”. My wife retired last May and we are working up to the idea of full-timing. She needs convincing :-) We have a new Keystone Alpine fifth wheel. Good luck in your travels, maybe we’ll see you down the road.